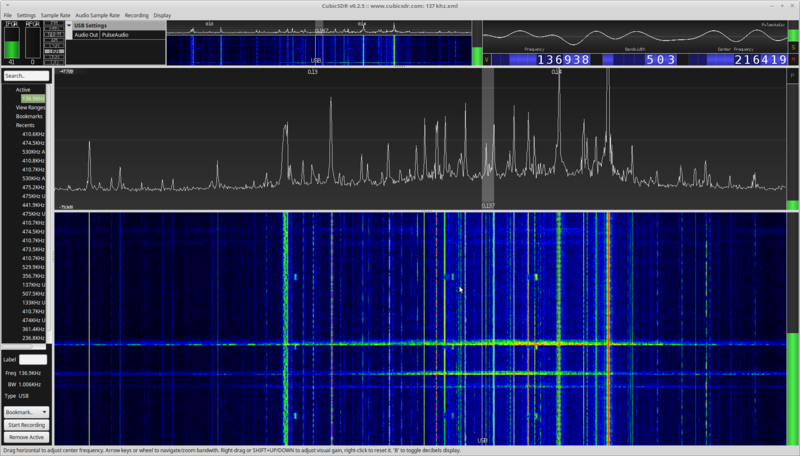 2200 meter band (137 khz) running CubicSDR on linux mint with SDRPlay. Antenna 900 ft wire grounded far end with tuned matching transformer. Reception reports are far more informative when they include a location. Contrary to common conceptions in most international forums, not everyone uses Windows and not everyone lives in the U.S.A.
Hi Ralf, I agree, but I do not see your location in your post. Better you omit the useless we from the PC screens. Much better see large so with received levels & noise level floor. So from where you receive? sdrom33 wrote: Hi Ralf, I agree, but I do not see your location in your post. I'm not sending a reception report, so it's not relevant in this context. If you must know, I'm located in the Western part of Germany, near the Belgian border. But you might agree that it makes a difference if someone receives a station over a distance of 100 or 10,000 miles. Hi fotoralf, please excuse my little experience, what is reception report? What must write in? Thanks! You guys like signal reports..here the Aviation NDB band between 200 and 240 khz. Lots of signals. Farthest NDB I copied is: 214 khz YIO, Pond Inlet, NU. Again 900 ft wire running LINUX Mint. I added 18 turns to the parallel tuned circuit for more Q. I am above the 1a noise floor now. Th elightning is near the Bahamas and near the Mediterranean, I looked on the real time lightning map for correlated strikes. I did tune down to 6 khz with a .15 uF capacitor across the coil. I was hoping to hear whistlers, but only heard 60hz buzz and lightning crackle. VLF Signal at 24 khz in Maine is very strong. Well my 1a was working great, but now its not. Its almost deaf. I though it was the antenna but I checked it several times and its seems OK with the yesau 450d. theres 6 volts p-p Rf from local stations. What I did was loaded the driver for the RTL-SDR and was comparing VHF reception, the 1a is much better, but now it hardly pics up anything on MW or LW. I wanted to try direct conversion on the rtl-sdr, but destroyed it by not being careful with the soldering iron. Could the 1a be stuck in high conversion mode? There is no switch in the Cubicsdr program. arcosine wrote: Well my 1a was working great, but now its not. Its almost deaf. I though it was the antenna but I checked it several times and its seems OK with the yesau 450d. theres 6 volts p-p Rf from local stations. ........ Could the 1a be stuck in high conversion mode? There is no switch in the Cubicsdr program. 6 Volts P-P RF is 2 volts RMS or 19 dBm. The RSP is only rated for 0 dBm continuous or 10 dBm for a short period. More than these levels can damage the front end of the RSP. That 6 volts is the unloaded antenna, before the 8:1 transformer, so the voltage at the 1a is less than 320 mV rms is <3 dBm with a 50 ohm load. 0 dBm? Thats 1 milliwatt. Well this 1a is headed for the trash can, POS. arcosine wrote: That 6 volts is the unloaded antenna, before the 8:1 transformer, so the voltage at the 1a is less than 320 mV rms is <3 dBm with a 50 ohm load. 0 dBm? Thats 1 milliwatt. Well this 1a is headed for the trash can, POS. Your other post said 60 V p-p on the antenna so it must have been a typo. At 3 dBm it would not have damaged the front end. Have you tried running it with SDR-Console or HDSDR to remove any chance of a software issue. ?